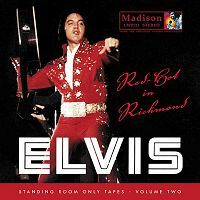 Madison's new release, Red Hot In Richmond, features the "2nd On Tour show" from 1972. This Richmond gig was first made available on Carry Me Back To Old Virginia by the Vicky label. Back then the show was not complete and the sound was only "good", not great. Madison, however, delivers this show in almost complete form and in stereo. Quite a catch! Many people have compared this release to Madison previous outing Greensboro Revolution! The general consensus is that the Greensboro CD has better sound, and some are even disappointed with the sound on Red Hot In Richmond. In my point of view the truth is somewhere in between. The sonic quality of the Richmond tape is clearly less than on the Greensboro tapes. However, while I found the mix on the Greensboro show to be a little bit "weak", I like the mix on the Richmond show. It reminds more of a professional mixed CD than the Greensboro one. Most likely Madison is sitting on the rough mix tapes, thus explaining the difference in the mix and sound picture. It is not very likely that the same company (persons) would create two such different mixes if they had multi-channel tapes available. It doesn't really matter, except for the fact that Madison themselves indicates that they are sitting on the multi-channel tracks of these shows... Not very likely! As for content, the Richmond CD offer a lot more than "Greensboro Revolution!" did. While the Greensboro show already was available in complete form and in perfect sound quality (mono) [The Greensboro Concert], the Richmond show has only been available in much poorer sound and painfully incomplete. Red Hot In Richmond appears like a totally new concert release! Elvis is in high gear, perhaps slightly less so than the day before in Hampton Roads, but certainly more focused than in Greensboro (April 14) or San Antonio (April 18). He attacks 'See See Rider' the right way, and jumps right into a terrific version of 'Proud Mary'. 'Never Been To Spain', 'You Gave Me A Mountain' and 'Until It's Time For You To Go' are all good renditions. The last one has Elvis fooling around a bit with his microphone. (As seen on "Elvis On Tour"). 'Polk Salad Annie' has Elvis going on high octane for well over two and a half minutes! 'Love Me' is a focused delivery, the song deserves it too! 'All Shook Up' is more turbo-charged than I have ever heard before, the Hampton Roads version included, while 'Heartbreak Hotel' reminds a lot of the version from Madison Square Garden some months later. Almost all Elvis fans seem to particularly like the version of 'It's Over' from this show. I don't understand why as I can't hear any major difference compared to the master version from Las Vegas, February 1972 or even the familiar Aloha version. They are all very good! I would like to be able to mix away the amateurish horns section on 'Suspicious Minds'. They are more audible here, than on Greensboro Revolution!, The Hampton Road Concert or even the official Close Up (disc 4). Man do they lack credibility! After a very fine version of 'For The Good Times' a top-notch version of 'I Can't Stop Loving You' follows. This song is in many ways classic for Elvis in 1972 (and 1973). Even though it is - and was - a much used song by other artists, it screams "Elvis!" Right after this song Elvis says "Blue Suede Shoes". However, 'American Trilogy' follows, although I can't hear any tape edits? 'American Trilogy' is a good version, but lacks the punch found on yesterdays take on the song (in Hampton Roads). After 'American Trilogy', 'Lawdy Miss Clawdy' fades in. A great version, and a pity it is not complete! Houselights up, then talk about the building and finally sing 'Funny How Time Slips Away'. A standard procedure from 1972 and some years on. 'Can't Help Falling In Love and snippets of 'Closing Vamp' ends the CD. Although one could wish that the sonic quality was even better, this is a very good CD. I certainly look forward to an official release of this concert. Until then Red Hot In Richmond will do nicely. Madison delivers tremendous art work. They have done so from day one. Their latest releases also have content that match the art work.